Learn how to combine the power of a Parse backend and the flexibility of a React Native frontend in your iOS apps! To get started with the tutorial, download the starter project and unzip it. The original application used ECMAScript 6 (ES6) but the starter project for this tutorial doesn’t. This is because Parse+React relies on mixins to bring Parse functionality into React objects, which isn’t supported for ES6 classes. A future update to React that adds supports for the key observe API will remove the need for using a mixin. Make sure the React Native pre-requisites are installed. This should be the case if you worked through the previous tutorial. This removes node from your path, downloads the latest version of io.js, and tells homebrew to run io.js whenever you run node. 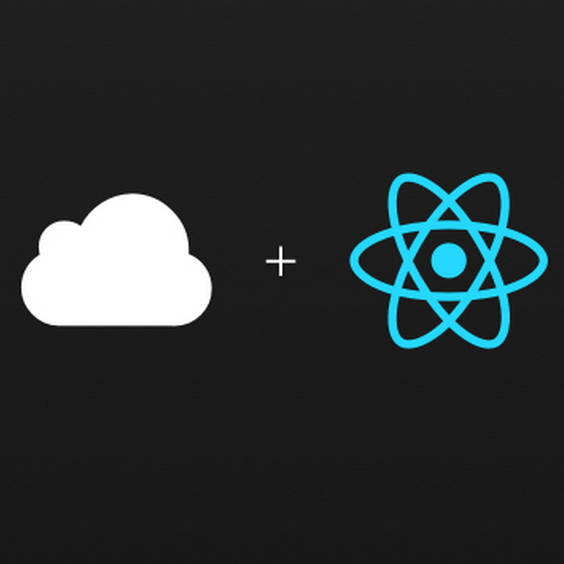 If everything looks good, then you’re ready to integrate Parse+React with your app. It’s available via npm or GitHub. Co-locating the Parse query in your component with the view makes it much easier to understand your code. You can look at your component code and see exactly how the queries tie into the view. In this tutorial you’ll take out the calls to the Nestoria API and replace them with calls to Parse. In the next few sections, you’ll see how to set up Parse to do this. 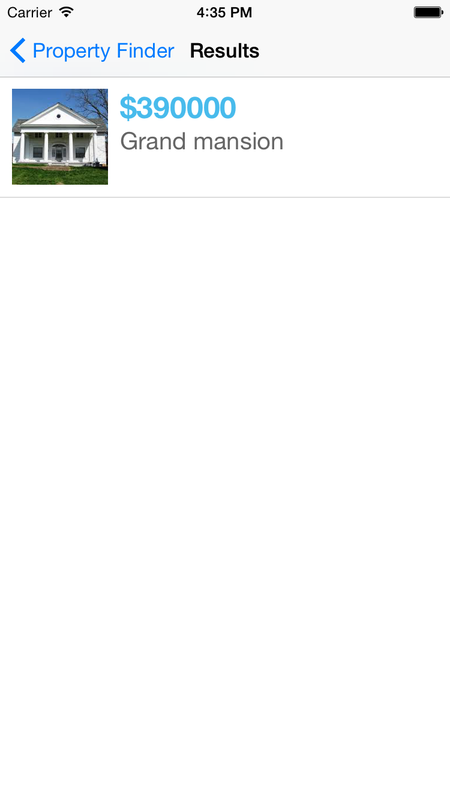 Click Core from the top menu to go to the Data Browser view, where you can see any data stored on Parse for your app. You should see a page stating that you have no classes to display. 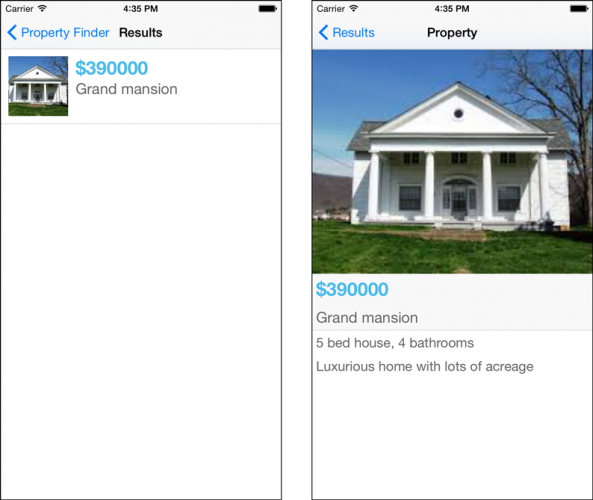 You’re going to take care of that by creating dummy data to represent property listings that you’ll pull into your app later on in the tutorial. 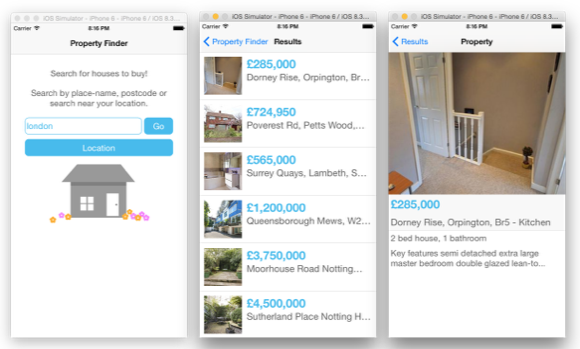 You can use the data displayed in the current PropertyFinder app to figure out what your schema should be. Open SearchResults.js and examine the renderRow function. Look for the fields from the Nestoria API that display the data. Next, open PropertyView.js and look at the render function to determine if there’s any additional information you’ll need for your schema. 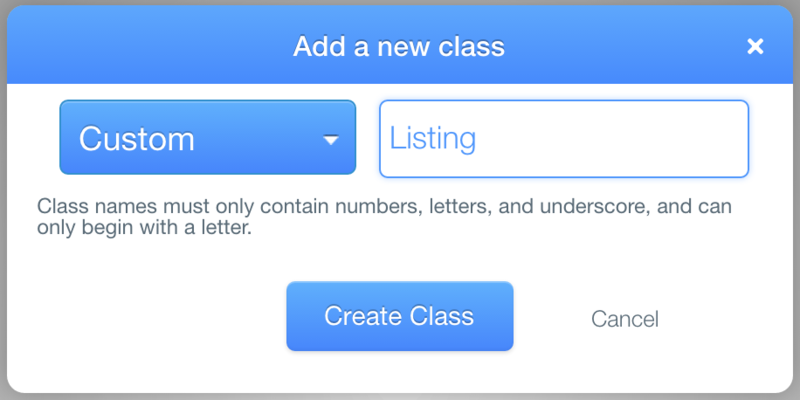 Once you click Create Class, you should see a new Listing class added to the left-hand side. There are other types of classes you can create, such as User, which has some special methods and properties not present in a custom class. However, your custom class will serve the needs of your app just fine. Think of a Parse class as a database table; the columns you’ll define next are similar in concept to database columns. You should see a new column appear in the header of your class. Parse supports many data types including string, number, boolean, and binary data. Here you’re using the File type to store binary data that represents a property’s image. Next, add a column to represent the price. To keep things simple, instead of naming the column price_formatted name it price, and select Number for the column type. objectId: uniquely identifies a row. This ID is auto-generated. createdAt: contains the current timestamp when you add a new row. updatedAt: the time you modified a row. ACL: contains the permission information for a row. ACL stands for “access control list”. You’re almost ready to touch some actual code — oh the anticipation! :] But you’ll need to add some data to work with first. You can download some sample property photos in this zip file. Download and unzip the file; the photos are contained in the Media directory. You should also see the objectId, createdAt, updatedAt and ACL columns set appropriately. By default, the ACL permission is set to public read and write. Click Save CLP. 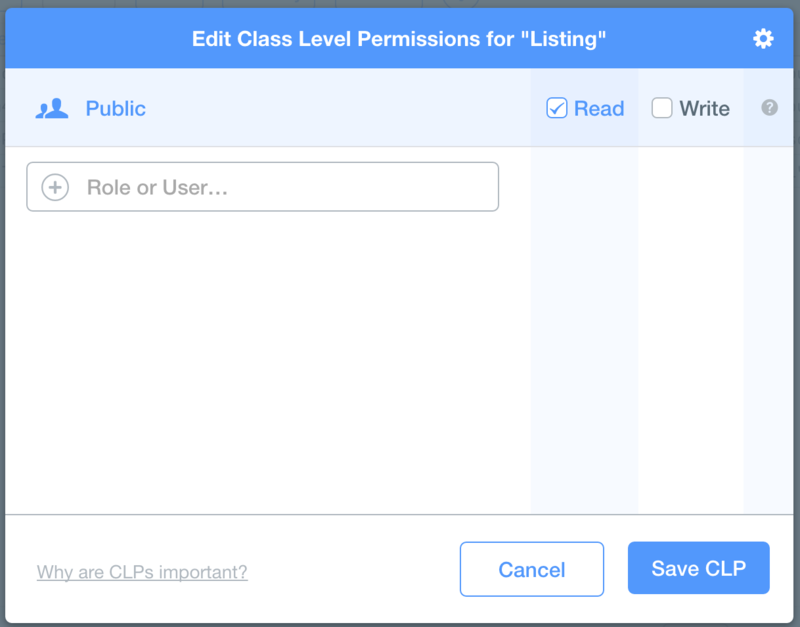 Note that the class level permission will supercede an individual row’s permission setting. Note: There are many options you can use to secure your data. You can learn more from this series of blog posts from Parse. summary: Luxurious home with lots of acreage. Armed with this pricely listing, you’re ready to modify your app and test your Parse setup. It’s finally time to get your hands on the code! 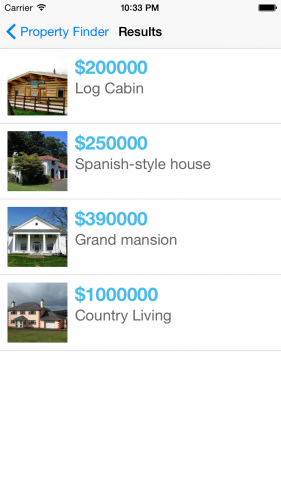 You’ll start by retrieving all listings on Parse, without any filtering to begin. 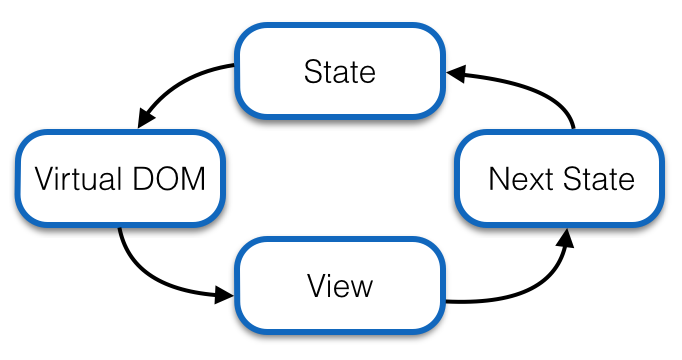 Don’t forget to add a comma (,) to the end of the react-native dependency. With this change, you’ve added Parse and Parse+React to your list of dependencies. Next, you’ll initialize Parse and add your credentials to the app. This loads the Parse module and assigns it to Parse. This loads the Parse and Parse+React modules and assigns them to Parse and ParseReact respectively. 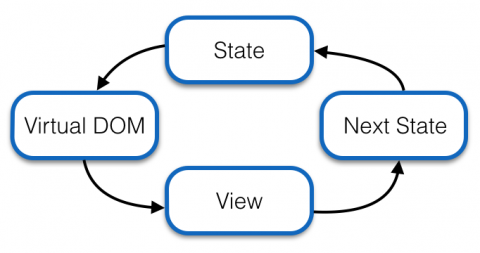 A React mixin is a way to share functionality across disparate components. It’s especially useful when you want to hook into a component’s lifecycle. For example, a mixin could define a componentDidMount method. If a component adds this mixin, React will call the mixin’s componentDidMount hook as well as the component’s componentDidMount method. ParseReact.Mixin adds lifecycle hooks into a component when it’s mounted or it’s about to update. The mixin looks for an observe method where the Parse queries of interest are defined. This sets up a Parse.Query for Listing data and adds a query filter to sort the results by least expensive first. This query executes whenever isLoading is true — which is the case whenever you initiate a search. The results from Parse.Query will be attached to this.data.listings based on the key — listings — that’s paired with the listingQuery query. Right now you’re not using the search term and loading all records instead; you’ll add this later on in the tutorial. Again, you’re calling `_executeQuery()` without using the location information just yet. This is a good point to test your fetching logic. ParseReact.Mixin forces a re-rendering of your component whenever the results return. 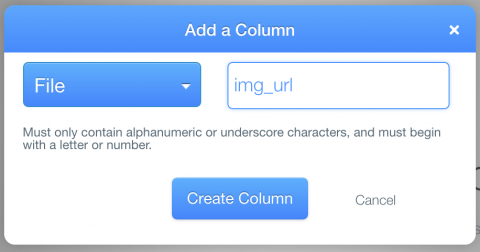 This logs the listing data each time you render the component — including after you run the query. Close the React Native packager window if it’s running so you can start afresh. The listing data is empty initially, but once you fetch the data it contains the single listing retrieved from Parse. You may also have noticed that the spinner remains once you’ve gotten the search results. This is because you haven’t done anything to properly handle the results. You’ll take care of this later on, but first you’ll take a brief detour into some UI modifications to use Parse data. You no longer have to worry about reformatting price data, since now you have control over the input data. You add the call to url() to access the actual image data in Parse. Otherwise, you’d only get the string representation of the URL. Parse+React identifies unique rows through an id property; therefore you’re using this property instead of the guid. 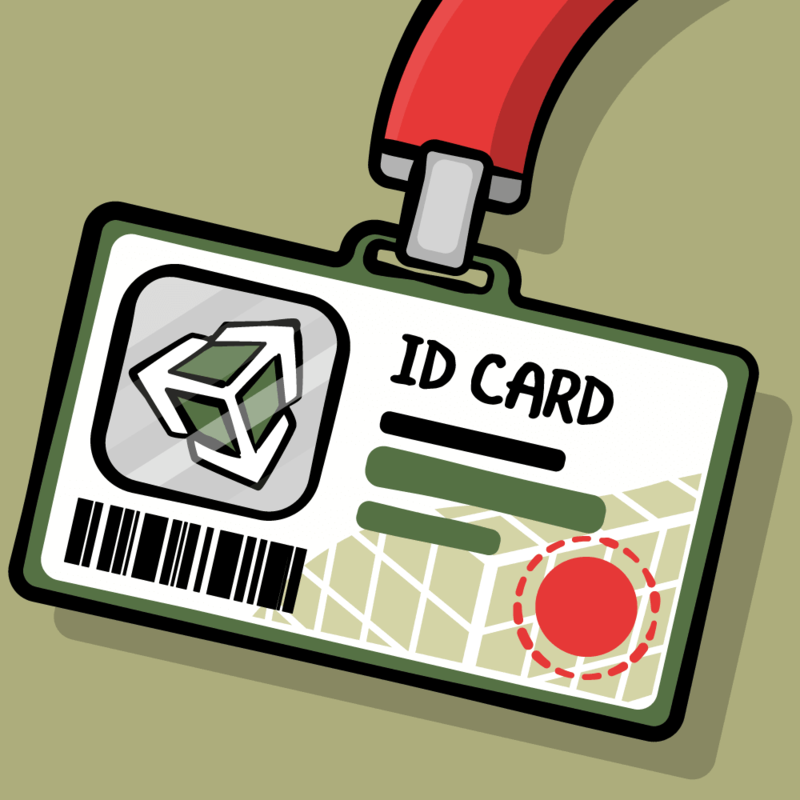 These changes will use id instead of guid to match up the data records properly. You’re not quite ready to test your UI code changes. You’ll first need to modify the data fetching logic to transition to your new UI. To properly handle the results, you’ll reset the loading flag in the SearchPage component and navigate to the SearchResults component with the listing data. Keep in mind that ParseReact.Mixin forces a re-rendering of your component whenever the results return. How can you detect that a fetched result triggered the rendering? Furthermore, where should you check this and trigger the navigation? ParseReact.Mixin exposes pendingQueries, which returns an array with the names of the in-progress queries. During the search, you can check for a zero length array to indicate the results have returned and hook your completion check in componentDidUpdate that triggers post-render. This code first checks isLoading and if true, checks that the query results are in. If these conditions are met, you reset isLoading and push SearchResults with this.data.listings passed to it. It’s generally frowned upon to change state in componentDidUpdate, since this forces another render call. The reason you can get away with this here is that the first forced render call doesn’t actually change the underlying view. Keep in mind that React makes use of a virtual DOM and only updates the view if the render call changes any part of that view. The second render call triggered by setting isLoading does update the view. That means you only get a single view change when results come in. It’s not much fun returning every listing regardless of the search query. It’s time to fix this! You may have noticed that your current data schema doesn’t support a search flow since there’s no way to filter on a place name. There are many ways to set up a sophisticated search, but for the purposes of this tutorial you’re going to keep it simple: you’ll set up a new column that will contain an array of search query terms. If a text search matches one of the terms, you’ll return that row. Next, you’ll need to modify observe to check for the existence of a place name query. The equalTo filter looks through the values of an array type and returns objects where a match exists. The filter you’ve defined looks at the place_name array and returns Listing objects where the queryName value is contained in the array. You do this as you don’t want to execute a place name search when a location query triggers. In your simulator, press Cmd+R; your application should refresh and you should see the new default search string. Tap Go and verify that you get the same results as before. Here you turn off isLoading to clear out the loading indicator. Here you check this.queryErrors, which is another method that ParseReact.Mixin exposes. The method returns a non-null object if there are errors; you’ve updated the message to reflect this. Here you check if there are no results returned; if so, you set the appropriate message. If there are no errors and there is data, push the results component. 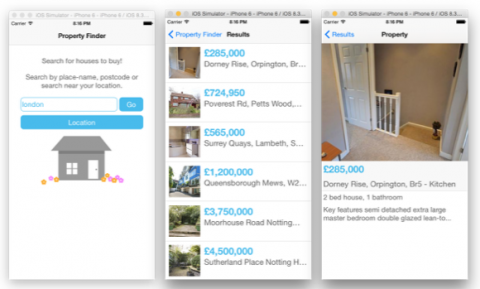 Feel free to add more rows to your Listing class in the Parse Data Browser to test additional search queries; you can make use of the sample photos available in the Media folder you downloaded earlier. 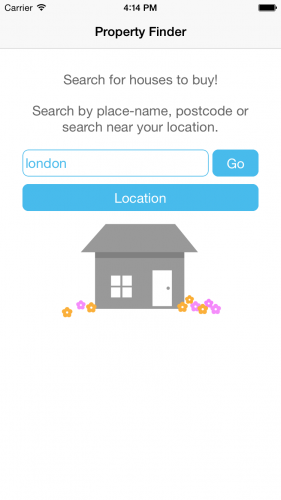 Querying locations is really easy to do with Parse, since Parse supports a GeoPoint data type and provides API methods to peform a variety of geo-based queries, such as searching for locations within a certain radius. You’ll need to add some location data for your initial row. This adds a new queryGeo state to hold location data. Here, you’ve added an additional parameter for the location-based query and then add whatever’s passed in to the current state. The search button is for when you’re searching by place name rather than by location, which means you can just pass in an empty object for the geoSearchQuery. This time, the updated call to _executeQuery passes in null for the search string and actual coordinates for the geoSearchQuery. 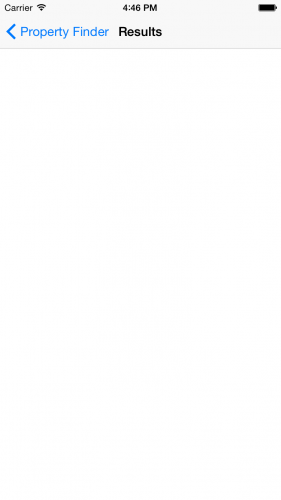 Here you check if this is a location query. Next, you create a Parse.GeoPoint based on the location coordinates. Finally, you add a filter for locations within 25 miles of the point of interest. Before you can test the location-based search, you’ll need to specify a location that will yield results. From the simulator menu, select Debug\Location\Apple to set your simulated location to a spot near Apple headquarters. The folder you downloaded earlier contains a JSON test data file — Listing.json — that you can import instead of entering your own data. Drag Listing.json into the upload area. Make sure the Custom option is selected and click Finish Import. You should receive a confirmation email once it’s done; since you’re importing a very small amount of data, this should happen very quickly. Once the import is complete, you’ll need to fix the image URLs. These will contain incorrect information and you need to upload the photos yourself. Go to all the newly imported rows and, one by one, delete the existing img_url entry, then upload the corresponding photo from the Media folder. You’ll notice you have a duplicate for the “Grand mansion” property, since you created it manually and it’s also in the import file. Delete one of the copies to keep things clean. For more information on Parse itself, check out our Parse Tutorial: Getting Started with Web Backends. If you want to hear more about React Native, have a listen at our podcast episode with Nick Lockwood, who works on the React Native team at Facebook. 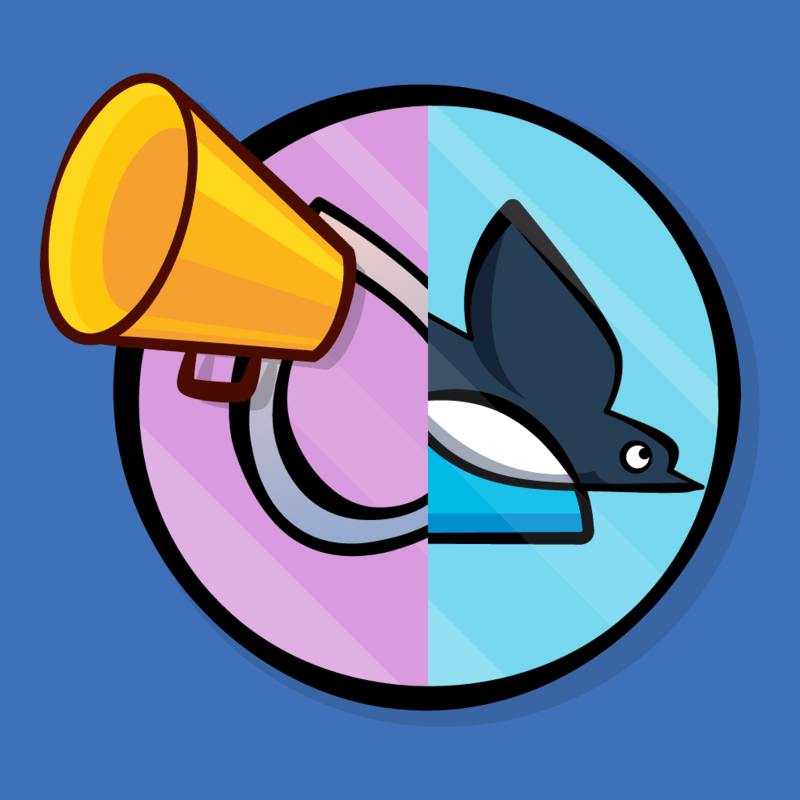 If you have comments or questions, feel free to share them in the discussion below!